Dealing with the effects of Alzheimer's Disease is a long and challenging process for the everyone involved. It is especially difficult in the late stage of the illness. Depending on the Alzheimer's Disease model you are looking at, the late stage is the third or the seventh stage. It can last a few months or a few years. A this stage the client is generally incapacitated and suffering from a dramatic loss of verbal skills, inability to recognize loved ones and difficulty with mobility, among other challenges. The focus of care at this stage is on quality of life and dignity. The client must be treated with respect and compassion and provided with emotional support. Although they may no longer be able to communicate verbally, there is a lot you can do to provide comfort and reassurance. In the later stages of Alzheimer's, people experience the world primarily through the senses. So focus on the 5 senses: incorporate sensory activities into your program that promote relaxation and well-being. Pay attention to non verbal signs and body language e.g. wincing, shifting, gestures. Remember non-verbal communication represents two-thirds of all communication. Reduce background noise where possible and avoid radio and TV; instead play soft and soothing music with sounds of rain, ocean waves or birds chirping. The goal for late stage Alzheimer's Disease is to make life as good as it can possibly be: physically, emotionally and mentally. Take into account the historic profile of the individual, likes and dislikes, and provide activities that cater to their remaining strengths and abilities. Visual props in bedrooms - a small fish tank, a bird feeder at the window, a clock, fresh flowers, hanging mobiles, lava or bubble lamps. Wind chimes in bedrooms or scenic nature photographs which you can change weekly. Gentle hand/foot massages (1 tablespoon of sweet almond oil and 2 drops of lavender). Pet therapy (ask family if person is fond of animals). ‘Borrow’ a puppy or a kitten for them to touch. Activity aprons for restless clients. Also offer comfort items such as soft toys, tactile balls. Fabric Books (infant books are suitable). Read a poem or part of a book that has meaning to them (ask the family for ideas). Even if the person does not understand what is read, the tone and rhythm of your voice may help them feel in safe hands. Play music they enjoy (ask family) or something from their ethnic background. Scented candles (unlit) in bedroom. An aromatherapy essential oil diffuser is another option. Tasting - ice blocks, jelly, and ice cream. Check with senior clinical staff first because many people with late-stage Alzheimer's have difficulty swallowing. Grooming - brush hair, apply moisturizer. Sit outdoors together, holding hands. Speak gently and reassuringly to them. It may help to make them feel safe and secure. Make a box of mementos to reminisce with - medals, books, photos and sit quietly with them showing them the items one by one in an unhurried way. Position bed or wheelchair near window or door for sensory stimulation. 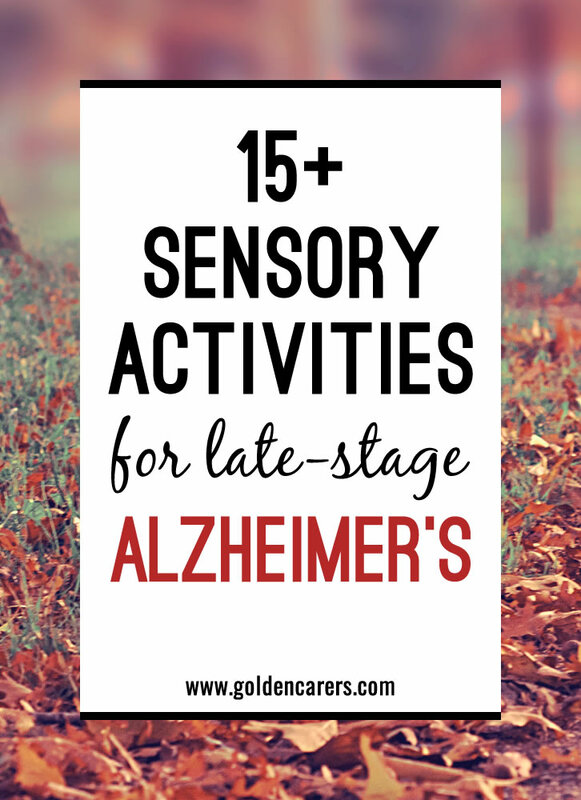 What activities have you found to work well with late stage Alzheimer's? Well done to all you people out there looking after these people. Amazing sharing your ideas and what works for you and your clients. Keep up the fabulous work, and thank you all for sharing. Thanks so much for your feedback Rachael! For one final stage woman I simply brushed her hair, her beautiful white hair, gently, for a long time--I had to keep switching arms--and then, this lady, who was almost entirely non-verbal, said, "Can you get it better than this?" I use pure coconut oil for hands and arms. It feels a tiny bit greasy (only press out a bit!) but this means I rub slowly and for a long time, particularly with my thumb on her palm. (I make "mini-containers" for sanitary reasons.) The scent is lovely for those who have not lost that sense. Many of my late stage clients have a tremour, which eliminates certain activities. But I use felt and bits of many colours and sizes of fabric, sometimes (one lady) just wanted to feel the fabric, but then she began to make pictures of a sort. Then, because she knew, maybe, that it was December, she took a larger white piece and gave herself a beard. She had no words but we laughed ourselves silly. She died in February. A number of men refuse anything "crafty" but will play ball if they still have eyesight and movement. These various sized and textured balls are very soft squishy and I sit almost knee to knee. Big "beach balls" seem intimidating sometimes. The majority of the interaction is really just our sharing of laughter, the ball is the tool. Balls are light, different sizes. I found one at a pet store. He never "misses" when he throws, I say, "Trick throw, you got me." And if he doesn't catch it, I get it off the floor and say, "Quick, no one saw that." Some women like this game too. Usually, aphasia permits little conversation, but sometimes I can get a response, "Did you play catch as a kid?" It's erratic though, there are days when this interaction isn't possible. I am a practicing occupational therapist assistant who deals a lot with dimentia patients. I am currently in a pickle trying to find ways to sensory stimulate a patient who is in the late stage. She is often in a stupor out state and very difficult to arouse. He ability and desire to communicate are severely diminished along with physical abilities, requiring max assist for all self care. I have tried a variety of sensory input but I'm trying to focus on tactile she doesn't respond to cold or light touch on cervical extensors does anyone have some ideas? Hi B, the late stages of dementia are really hard because there is so little feedback. Have you tried music? Find out what music she liked and see if there is a response. If you can’t find out, play music that was on the hit parade when she was between the ages of 16 and 26 years old. Also, don’t think she is 'not there’; she may still enjoy your touch, your smile, and a sense of feeling secure and cared for. Make sure you have attractive, mobiles hanging from the ceiling, so she can appreciate colours and movement. All the best. Cathy, terrific ideas for your sensory basket. Thank you for sharing them with us, I hope to incorporate a couple of the ideas into our baskets. We have a sensory basket. It is an old wicker picnic basket filled with things to touch and do. EG: different textured material, feather boa, scourer pad, I spy bag, artificial flower ( we spray it with perfume occasionally), bells, brush, squishy ball, bubble maker and more items like that. We had an elderly farmer and he use to have a black and white Kelpie he loved. I found a stuffed toy kelpie in an op shop and bought it for him in mind. He loved it and would sit patting it for ages and when I spoke to him anout his dog he would smile. I once asked him if he "whistled up" his dog and how was it done. Lo and behold! he started whistling! Now the farmer has passed on but the "dog" is still used for dog lovers for cuddles. I have middle to late stage dementia, and I find our residents love country western music(old style) 60's music and Cook Island music. Some tap their feet, some get up and dance or jiggle, and you can feel the happiness in the room. We dont have a T.V. in our activities room.